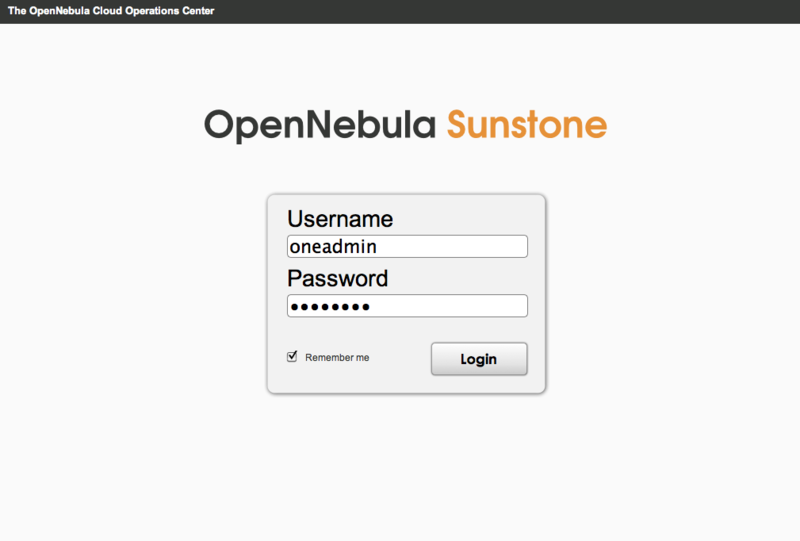 In a few days OpenNebula 2.2 will be released, and along with it our brand new Cloud Operations Center: OpenNebula Sunstone, a GUI intended for users & admins. Enjoy them and stay tuned for further updates! In C12G Labs, we have prepared this article to describe our subscription model for OpenNebulaPro and its value for the effective management of your cloud or data center infrastructure. 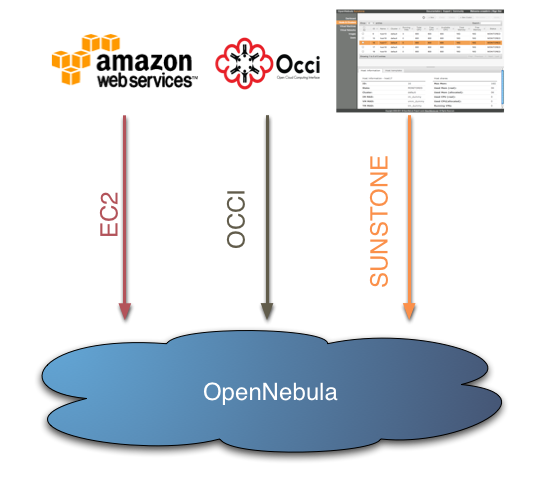 OpenNebulaPro does not only implements the most common cloud interfaces, it additionally provides state-of-the-art unique features for cloud management and a comprehensive management framework for virtual data centers. Our experience shows that the investment in OpenNebulaPro can result in significant business value and reduction of expenses with very high return on investment. OpenNebulaPro is a commercially supported distribution of the widely used OpenNebula open source toolkit with stable and tested software extensions and the patches for its operation in business environments. OpenNebulaPro represents a supported and certified enterprise-grade distribution with the best balance of maturity and features selected based on their appropriateness for commercial deployment. Supported Linux distributions are RedHat Enterprise Linux, Suse Linux Enterprise, CentOS, Ubuntu, Debian and OpenSuse; supported hypervisors are Citrix XenServer, VMware ESX/ESXi/vCenter, KVM and Xen; and the supported cloud provider for cloudbursting is Amazon Web Services. OpenNebulaPro is provided on an annual subscription basis, so customers and partners have access to new versions of the software that are released during the subscription lifetime at no additional charge. You do not have to pay expensive up-front license fees. 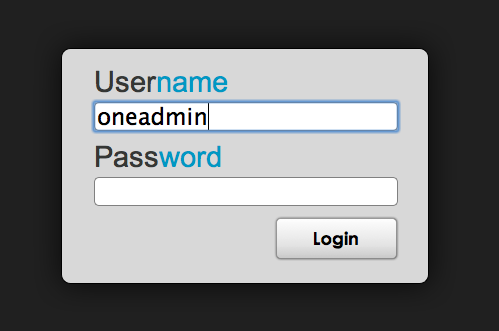 The support subscription grants a perpetual license to use software on production environments. However, only customers and partners with an active subscription can access our support portal that brings several additional benefits in terms of long term support, production-level support with professional SLAs, integration support for optimal and scalable execution in any hardware and software combination, certification support to validate compatibility with complementary components and customizations, regular updates and upgrades, and additional tools for the administration of OpenNebula cloud instances in production environments. The technical support subscription is based on per server (hypervisor host) and per site pricing models. C12G can also apply hybrid models for customers delivering OpenNebulaPro via timesharing and utility services where the customer pays a fixed fee independent from the number of servers and variable fee which scales according to your use of the platform or your sales. Support subscription starts at 250 euros per physical server. This subscription fee represents less than the 5% of the typical annual operation and maintenance costs of the server. In typical 2 x Quad-Core servers, this only represents 125 euros per socket or 30 euros per core, which is only the 6% of the 1-year reservation fee of a small one-core instance in Amazon EC2. Reduced operations costs with consolidation of hardware and software while simultaneously reducing power, cooling, and management costs. Moreover our support for hybrid cloud deployments, with the combination of local and remote Cloud resources, allows you to eliminate the over-purchase of systems to meet peaks demands. Increased operations efficiency with greater flexibility and better utilization of the infrastructure. In traditional enterprise-owned data centers, server utilization commonly averages 5%-20%. Depending on the application, you can lift to between 40% and 60% allowing two to three times as much revenue from the same infrastructure investment. Improved user productivity with faster delivery and elasticity of services. Users have access to virtualization and cloud interfaces that considerably simplify the management of their service workloads. Cloud computing can offer significant business benefits to most organizations, but for these benefits to be fully realized you need an effective way of managing the cloud infrastructure. OpenNebulaPro offers a production ready, scalable and feature complete product at a fraction of the competition’s price to get the highest return of investment. The RESERVOIR project is organizing a community event to present the latest results in Cloud Computing. 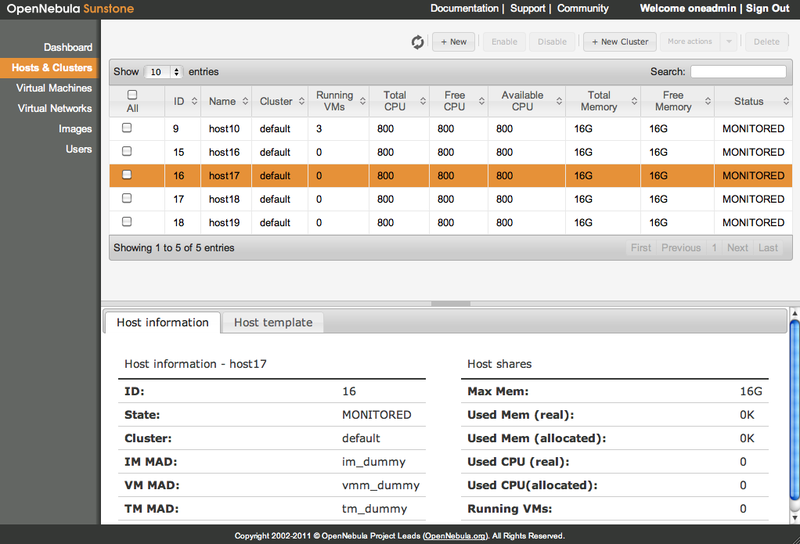 The event includes a demonstration of the RESERVOIR Framework, with a particular attention given to OpenNebula. IBM will define the Cloud Computing model and SAP, Telefónica and THALES will describe industrial and government applications. The detailed Agenda and Registration is available at the RESERVOIR site. 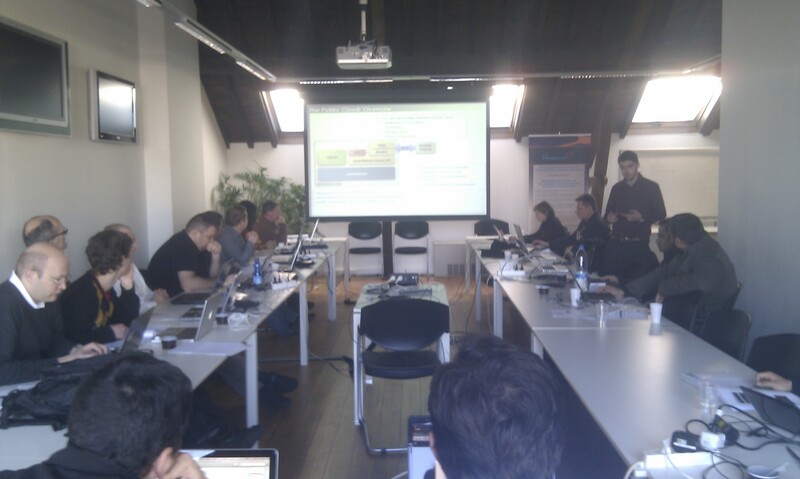 The RESERVOIR project organized an OpenNebula training session in Brussels on January 27-28, 2011. The training was given by CETIC and the DSA-Research.org group at UCM, taking place in the IBM Meeting Room at Digitaleurope. It featured an extensive tutorial on how to install, configure, tune and use OpenNebula to build Private, Hybrid and Public clouds. It also included a last session by IBM presenting its integrated Private Cloud Service Delivery Platform. 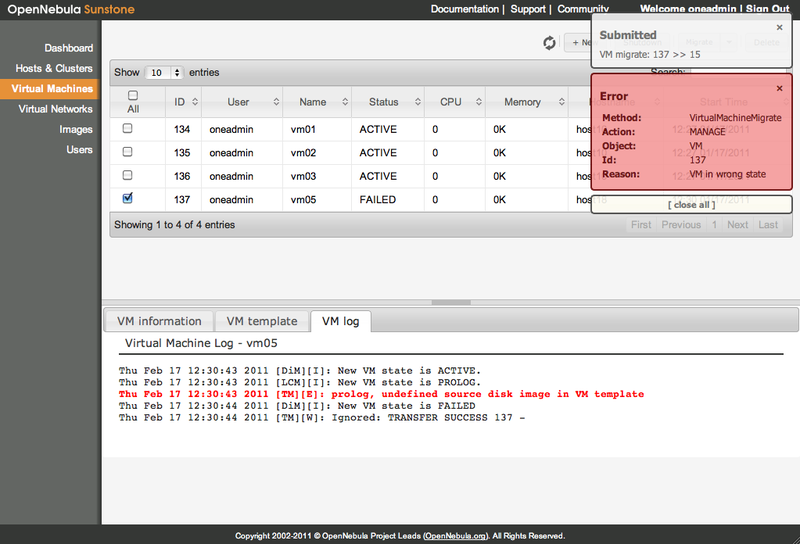 The material from the training can be downloaded from the OpenNebula site and from the RESERVOIR site. The event was attended by several organizations that actively use or are planing to use OpenNebula as their core toolkit to build clouds. Attendees included people from several companies, such as Capgemini, Guardis, 4D-Consult, Orange, Logica IT, Engineering, Alcatel-Lucent, Philips, SNCB and CAET; from grid and supercomputing centers, such as PDC, EGI, NIKHEF and JSC; from academia and research institutions, such as UPM and INRIA; and from government and public administration, such as European Commission. Many of these organizations have shown their interest to engage in the OpenNebula community. All in all, it turned out to be a successful and very formative event. Given the success of this training, additional sessions will be organised within the upcoming months. Details will shortly be made available. 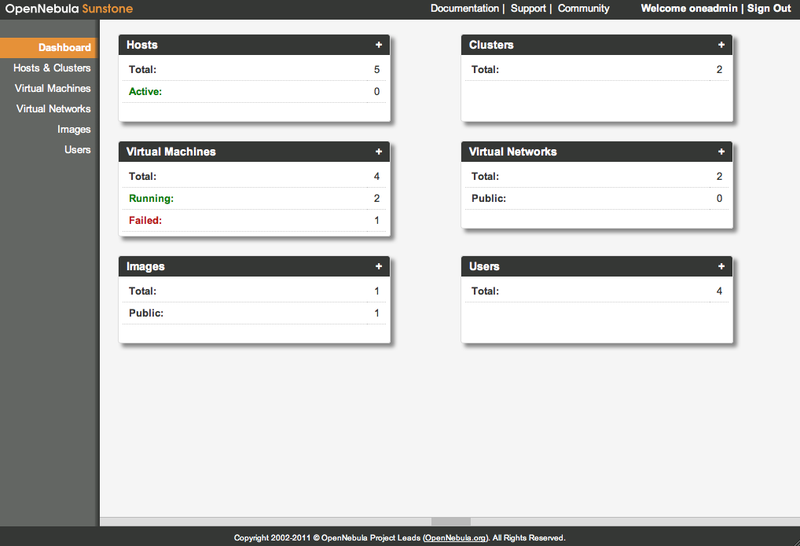 We are happy to announce that an OpenNebula project has been created in the openSUSE Build Service. We would like to thank Robert Schweikert, Peter Linnell and Greg Freemyer for their efforts and for taking the time to answer our questions in their mailing list. If you have the time to test it or want to help them improve it, please send your feedback to the openSUSE Packaging mailing list!